Beware: backgammon may be illegal. A bit of historical background: one day in 1876, a Mr. Wetmore settled down with a friend for a game of backgammon in a railway station in Alabama. He almost went to jail. For over 70 years, Alabama law had prohibited the playing in public of "any game or games, with cards or dice." No one before had been prosecuted for playing backgammon, but an ambitious sheriff probably thought it worth a try. His hunch seemed right; Wetmore was convicted by a jury of the misdemeanor. But Wetmore was saved in the end when the Supreme court of Alabama threw out the conviction, ruling that backgammon did not depend entirely on the roll of the dice. "Dice do not determine the result of the game. That is determined by the moves of the men by the opposing players; . . . this is brought about much more by the skill of the contestants than by the accidental fall of the dice," the court ruled. Today, more than a century later, the legal status of backgammon is still in doubt because of varying interpretations of antigambling laws. Ted Barr, a well-known tournament promoter on the West Coast, was arrested last March and charged with two misdemeanor counts of gambling for holding a tournament in Portland, Oregon. The tournament, held in the Marriott Hotel in the city, was a successful three-day affair, Barr said. Prizes had been awarded when two plainclothesmen, who had participated in the tournament, placed him under arrest. Barr, according to Steve Rickles of the Portland district attorney's office, was charged with promoting gambling and with bookmaking for allowing sidebets to take place on matches. Rickles's office prosecuted on the basis that backgammon was a game of chance and not one of skill. Barr, whose trial is set for Feb. 17, said he thought his case was one of "discriminatory prosecution." Because his was the largest operation in the Northwestern region, the Portland authorities decided to make an example of him, in order to clarify Oregon gambling statutes, which prosecute "the promoting of a game of chance in which gambling plays a material outcome." "We don't feel that we're wrong," Barr remarked. "We feel that it (backgammon) is a game of skill." Barr claimed that he had not been given notice by Portland authorities that his tournament was violating the law, despite an enormous amount of publicity before the event. Also, he countered, he had taken "reasonable" steps to prevent sidebetting, but as promoter, he should not be held entirely responsible for everything that went on. In Oregon, as in other states, gambling laws do not specifically mention the game of backgammon, leaving the prosecutions of tournaments solely up to municipalities who are often arbitrary in their treatment of the game. Barr, for example, said he had held tournaments previously in other Oregon counties, and had assumed that he would not have any trouble with gambling laws. Such ambiguities are typical of backgammon prosecution controversies. The key question in the legal battles is one of whether or not backgammon is a form of gambling. Local interpretations vary widely. State antigambling laws take three forms: constitutional provisions are of the highest authority. Many outlaw gambling in general language, but make specific exceptions for state lotteries, parimutuel betting, and bingo. Statues, which are passed by state legislatures, must conform with the states' constitutions. They apply throughout the state. Ordinances, which are enacted by local governments, must not run afoul of the states' constitutions or statutes. New York's statute, which is typical of most states, says that a person engages in gambling when he stakes or risks something of value upon the outcome of a contest of chance. A contest of chance is defined as a game in which the outcome depends in a material degree upon an element of chance, notwithstanding that skill of the constestants may also be a factor. In New York City, backgammon is not considered a game of chance. 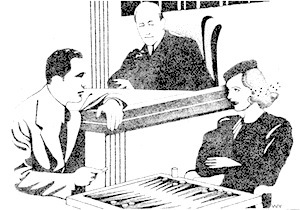 According to Armando Flores, of the city public morals division, his office would not prosecute backgammon as gambling. He admitted, however, that no cases had ever come through the department, adding that he thought a test case might arise if backgammon continued to grow in popularity. Other New York authorities concurred. Barbara Thompson, of the District Attorney's office, said there is "nothing in the penal code" mentioning backgammon as a game of chance or skill, but added that interpretation of the state law was local. "I don't think it has ever come up," she added. In California, too, backgammon is not specified in antigambling statutes. An official from the Los Angeles district attorney's office said that the office would probably not prosecute backgammon tournaments, but added that the question was "unclear." The California statutes, he said, also define gambling as "wagering" on a game of "chance." Even within a state, there is often ambiguity in application of antigambling statutes. In Pennsylvania, where gambling statutes strictly prohibit any gambling activity, authorities from the district attorney's offices in Philadelphia and Pittsburgh disagreed sharply on backgammon's legal status. Eric Hansen, of the Philadelphia district attorney's office, said that backgammon tournaments were "absolutely illegal." There would be no way, he said, that anyone could organize one without prosecution from his office. "Backgammon is a game of chance." The district attorney's office in Pittsburgh, on the other hand, took an opposite view. "Backgammon, arguably, is a game of skill," an official said. He admitted that backgammon's status was locally determined; in Pennsylvania, the game is not mentioned in antigambling laws. The few recorded legal battles over backgammon have usually revolved around the issue of whether backgammon is a gambling game, or one of skill, like chess or bridge. As early as 1858, for example, the Supreme Court of Texas noted that while chess and billiards are games of skill, and raffles and lotteries are games of chance, backgammon is best labeled a "mixed game of chance and skill." Both tournament promoters and legal authorities had widely varying ideas on the possible effect of either an innocent or guilty verdict in the Barr case. Les Boyd, a Florida tournament promoter, said that the effects would be limited. He has not had any problems with local authorities, he said, because he conforms with local gambling statutes. Boyd thought there was no problem in the United States with backgammon laws and that the Barr case was isolated. "Backgammon will be prosecuted in the United States when they start prosecuting Monopoly." Boyd attributed the prosecution to rivalries between competing promoters. "Barr put the noose around his own neck" with his enormous publicity, Boyd contended. The district attorneys' offices contacted also thought the effects would be local, confined only to the Northwest region of the United States. Barr, however, thought otherwise. He said his case would encourage tournament promoters to lobby state legislatures for changes in gambling laws to allow for, at the least, licensing of legitimate backgammon tournaments. "In order for backgammon to grow, we've got to get a precedent set and use it as a tool," he remarked. Barr said he had spent $5,000 already on his case and could easily spend $10,000 more to set his precedent. Barr claimed he could have gotten away with paying a $200 fine but fought because a guilty plea would have meant the end of backgammon tournaments in Oregon and encourage prosecutions in other states. For the past year, no tournaments have been held in Oregon because of the promoters' fear of prosecution. As backgammon continues to grow in popularity, its legal status must be clarified. A uniform policy of antigambling law enforcement must be set in order to avoid situations such as Barr's and various other cases throughout the country. Meanwhile, until backgammon becomes specifically defined legally as a game of chance or skill, it remains submerged within what Barr terms "the grey area" of antigambling laws.